Chilli Paneer is on its second season and this time the campaign involves added attractions on digital. Not only is the Chilli Paneer 2 digital film an interactive one, it also helps you discover your personality type. Who knew that watching a film can aid in self-discovery! Last September, DBS Bank India, one of Asia’s leading financial services group embarked on a digital storytelling route to build brand awareness. Taking inspiration from the long format ad films that were the rage last year, DBS Bank had launched the first season of Chilli Paneer – a sweet love story of Ken Chang from Singapore and Asha Rao from Mumbai. Brought to the digital world through four episodes, the film was a perfect blend of love, food, dreams and the seamless integration of banking into our lives. While we watched Ken and Asha fall in love, we also saw their budding relationship go through the ebbs and flows of a inter country relationship. The story ended happily though, with the two being able to set up their own restaurant in Mumbai, something they had each dreamt about. Of course, their relationship manager from DBS Bank, Amit Sharma played a vital role in their lives, right from explaining the financial nitty-gritties to the best services they could avail from DBS. The digital campaign was supported by a website with help from its social media properties on Facebook and Twitter. Chilli Paneer 1 managed to garner over 1.2 million views across platforms. 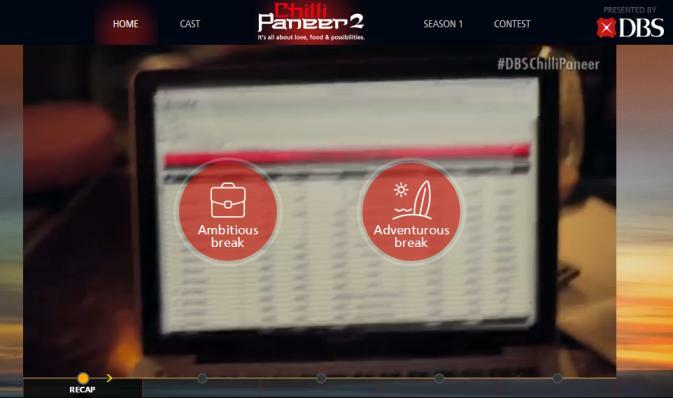 In the second season of Chilli Paneer (CP 2) launched in December, DBS Bank India has raised the bar on digital in association with Sapient Nitro – the creative and technology partner for the campaign. The story now offers not one but 8 happy endings by including user interactivity in the film. A viewer slips into the shoes of Ken, faces their situations and decides on a particular course of action. CP2 has four decision points where Ken and Asha would face a particular situation and need the viewer’s help in deciding what to do; thus creating 8 possibilities to the story! Every decision made by the viewer indicates an attribute, which has been mapped to a personality type. You can watch the film at the Chilli Paneer 2 website to discover your personality type. Along with introducing interactivity that enables viewers to decide the course of Ken and Asha’s story and the bank to help understand consumer behaviour by the choices they make, social media promotions have also been tweaked to add a social persona to the characters, thereby adding more depth to CP2. This time users can communicate with Ken and Asha, all one needs is a Twitter account. The leads – Ken and Asha – each have Twitter accounts that you can interact with. The two are also actively sharing their film and spreading about the campaign much like the DBS Twitter handle, thereby amplifying the reach on Twitter. Followers of Ken and Asha are occasionally given new recipe ideas and food suggestions, when not urging them to watch their film and participate in the varied contests. Interestingly, both Ken and Asha have distinctive tweets reflecting their personality. Wish I could master the art of Kite flying, I envy those little kids! Remember Ken was an avid food blogger Asha used to follow and admire? 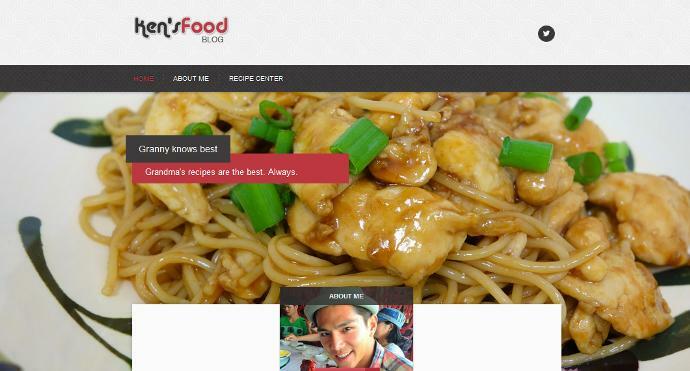 Well, Ken’s food blog can be followed by any foodie out there. It is replete with his favourite recipes and the ups and downs of his personal life. Ken has been updating his blog alongside their developing love story. With posts titled, “A trip of a lifetime’, ‘Reflections in the morning sunshine’, ‘When your restaurant booms, life takes a hit!’ and many more, we see Ken sharing a myriad of emotions in his journey with Asha. Again, a reader is taken through the various junctions at which the DBS Bank relationship manager helped the couple take their decisions. Social media buzz and engagement go hand in hand when one hosts fun contests. CP2 made Fridays fun with its simple contests on both Facebook and Twitter pages of Chilli Paneer. While 3 winners from every contest won vouchers from Bookmyshow, one lucky person from all the winners will be chosen for the grand prize – couple return tickets to Singapore! Contests required participants to watch the film for the right answers as well as get closer to Ken and Asha. The #8HappyEndings contest on Twitter asked simple questions and helped spread awareness. In fact, the keywords – “DBS Bank” and ‘Amit Sharma” both trended on the day of the contest. The brand has ensured awareness is also happening amid contests. It has been sharing short story videos highlighting the benefits of banking with DBS. The latest Facebook contest is inviting fans to invite Ken and Asha to their city as the couple are searching for an ideal place for their third restaurant. Fans need to post their city in the comments section on the Facebook post, give a compelling reason for Ken and Asha to visit it and also talk about its food specialty. Interesting visuals urged fans to discover their personality type. Chilli Paneer 2 is building the brand, one story at a time. The blend of creative storytelling and technology has brought the consumer closer to the brand; he/she is able to experience the various benefits of DBS Bank as they step into Ken’s shoes. The inclusion of interactivity to the film is a win-win for both DBS and consumer – while the consumer experiences how banking with DBS can help fulfill her dreams, DBS understands her personality and how it can offer services to cater to this consumer type. CP2 only takes Ken and Asha’s story forward but also helps spread awareness for DBS Bank together with fun engagement. The clever use of social media alongside the story is noteworthy, especially with Ken’s food blog and the Twitter handles of the two lead characters. CP2 is building a relevant community on social media, one that is aspirational and looking for the right banking partner to fulfill their aspirations. It would be interesting to know how consumer behaviour data will be leveraged by DBS.